Here're tips of how to reduce video file size without losing quality, for example to shrink big-sized videos MKV, MTS, HEVC, AVI, MP4 etc on PC/Mac. Have the following troubles happened? It's too slow to upload a high definition video to YouTube/Facebook or even goes to failure; fail to send via emails because it exceeds the attachment file limitation, storage of hard drive or phone is almost occupied by big-sized video with no space to save one more. Instead of giving up video upload or deleting valuable videos from collection, to reduce video size is seemingly a better solution for a favorable result. How to reduce video file size without losing quality? Is a video size reducer in need? Read on to get answers. In terms of factors to influence video size, compression format, parameters and length, we can pick to convert video for compression, modify parameters and shorten video duration for video size reducing. What are the best formats can output small video size? • HEVC/H.265 – It features higher data compression ratio compared to its predecessor H.264 so that it can deliver the same quality at a lower bit rate . • H.264/AVC – It is regarded as the most efficient video compression standard for high data compression ratio and great quality before the releas of HEVC. Generally speaking, a MP4 file encoded with H.264 will have small size. • FLV – It is also known as Flash video and used to deliver video over the Internet using Adobe Flash Player. Although HEVC can help produce a UHD video with smaller size, it requires great hardware for flawless playback and has limited compatibility so that it can't work well on a older computer or device. H.264 is the best choice for users who want to store video with smaller size for it has lower system requirements and higher compatibility. FLV has smallest video size suitable for video-sharing websites but the quality is not so good. WinX HD Video Converter Deluxe is a very easy-to-use tool capable of converting any videos (MKV, MTS, AVCHD, H.265/HEVC etc.) to MP4, WMV, MOV and delivering crisp images and lossless audios. Thanks to Hyper-threading technology, Multi-core and Hardware Encoder (Intel & Nvidia) support, it can achieve a super fast video converting speed. Launch WinX HD Video Converter Deluxe and tap +Video button on navigation bar. The Output Profile dialogue box pops up the moment the target HD/4K/8K video is added. Go to General Profiles category and select MP4 Video (codec: h264+aac) if you hope it can be accepted by more devices/websites or HEVC Video (MP4 file format) if you need a high video quality and has a computer powerful enough to handle HEVC. Tap browse button to save video and RUN button to reduce video file size without losing quality. Resolution, frame rate and bit rate are three keys to affect video file size mostly. 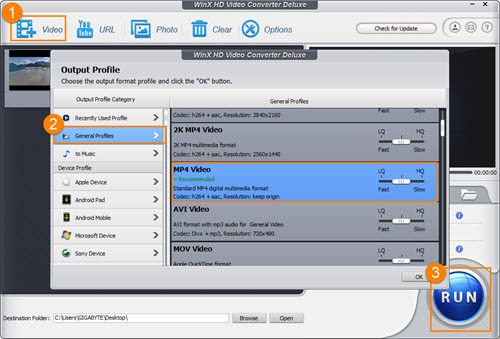 If you have gotten some big-sized H.264 files, you can reduce video file size by rearranging those parameters using WinX HD Video Converter Deluxe. 1. 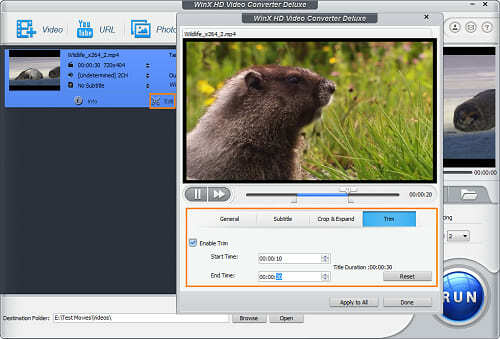 Add video you want to reduce file size by clicking +Video button and select output format. Select original H.264 as output format. 2. Tap setting button to access parameters dialogue. Change frame rate and resolution to a smaller value, for example 23.97 fps, 640x480. When adjusting video bit rate, select CBR and decrease the number. Also, you can set less sample rate and bit rate of audio to get a more reduced video file size. 3. Click RUN button to reduce video size. Not every frame of video should be preserved. You can discard title sequences/epilogue which presents movie title, production, casting or filming titbits, and About Author segment of videos downloaded online. 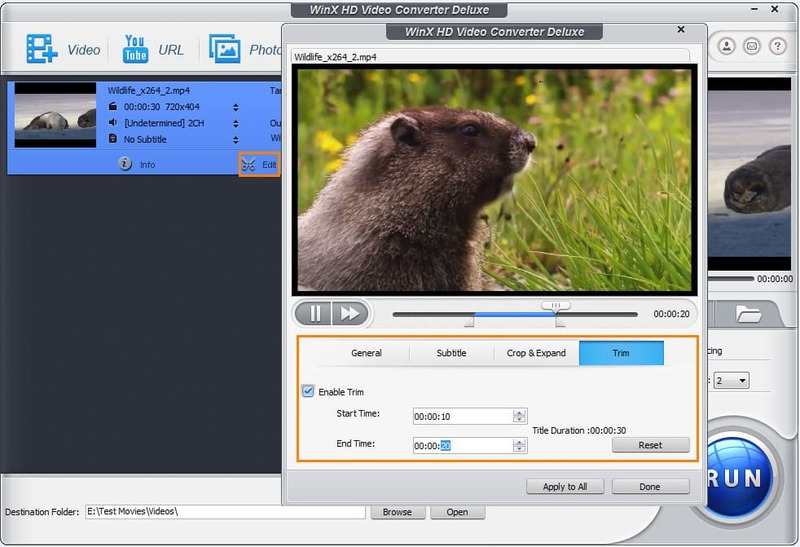 This versatile video size reducing software – WinX HD Video Converter Deluxe enables you to trim video by setting start time and end time to capture the most valuable clip to make video size smaller. 1. Tap +Video button to add target movie/video and select output format which can be original video format or more compressed video formats. 2. Tap Edit button. Choose Trim tab from the popping-up windows. Check Enable trim. Next, set start time and end time by manually inputting certain numbers or dragging progress bar. The built-in monitor can help to pick out the wanted clip. 3. Tap Run button and you can get a trimmed video clip with shrink file size. WinX HD Video Converter Deluxe takes full advantage of graphic cards on your comptuer to achieve level-3 hardware acceleration to deliver the fastest performance to reduce video file size while keeping a high quality. Because GPUs offloads media tasks from CPU, multi-tasking can be smoothly completed by CPU. • Compress HD/4K videos to MPEG-4, WMV, FLV or other compression video formats occupying less storage of hard drive and portable devices or uploading to YouTube faster. • Offer adjustable parameters (resolution, frame rate, bit rate) and trimming option to reduce video file size in a pretty simple way.